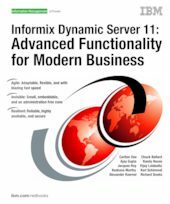 In this IBM Redbooks publication, we provide an overview of Informix Dynamic Server (IDS) 11. IDS is designed to help businesses leverage their existing information assets as they move into an on demand business environment. Requirements here call for a flexible data server that can accommodate growth, in applications, data volume, and numbers of users. And it offers the capability to minimize downtime and to provide the high availability required today. A new suite of business availability functionality provides greater flexibility and performance, automated statistical and performance metric gathering, improvements in administration, and reductions in operating costs. The IDS technology enables efficient use of existing hardware and software, including single and multiprocessor architectures. And it helps you keep up with technological growth, including such things as the use of nontraditional data types. Built on the IBM Informix Dynamic Scalable Architecture™ (DSA), IDS provides a next-generation parallel data server architecture that delivers mainframe-caliber scalability; manageability and performance; minimal operating system overhead; and automatic workload distribution. IDS delivers a lower total cost of ownership (TCO) by leveraging its well-regarded general ease of use and systems administration. It enables customers to use information in new and more efficient ways to create business advantage.